Teahouse is located at 501 Yonge Street, occupying a city block between Alexander and Maitland. Steps from two subway stations. Minutes to luxury shopping in the Bloor-Yorkville. A short walk to the Eaton Centre, restaurants, patios, and bustling street life. Teahouse is ideally situated to take advantage of everything the city has to offer. In close proximity to several major employment hubs, schools, hospitals, shopping districts and cultural attractions. 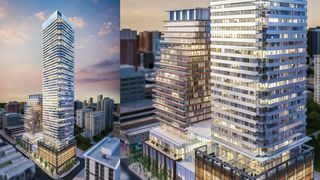 The area is witnessing a transformational change – with an influx of new businesses and residential life that now sees Yonge and Wellesley as a true destination. Teahouse will ultimately consist of two residential buildings and ground floor retail. The moment you enter the lobby a sense of calmness envelopes you. The beautiful lines, the muted lighting and the elegant natural materials, allows you to leave the world behind and relax. Perhaps you will stop and enter the Tea Room, where you might lounge a while to refresh before you ascend to your suite. The amenites designed by Munge Leung include an outdoor pool, and an indoor Onsen pool which features a set of four separate pools with different water temperatures, all designed to soothe your body. Relax in the Rock lounge after a workout in the fitness center or yoga room. Invite guests and entertain in the party room with formal dining and indoor and outdoor lounging space with barbeque area or perhaps watch a sporting event in the theatre room. The 24 hour concierge is always available to assist you. Suite features include laminate flooring, porcelain or marble tiles in most areas; and Munge Leung-designed kitchens with granite countertops, ceramic tile backsplash, and stainless steel appliances. At the upcoming VIP sales event pricing will start at $199,900 for the smallest bachelor unit (318 sq ft), and $609,900 for the smallest 3 bedroom unit (starting at 903 sq ft). Parking will be an extra $55,000 (for 2 bedrooms or larger), and lockers are $5,000. Estimated occupancy is June 2018.